ABC Promoting Klein for Heisman? 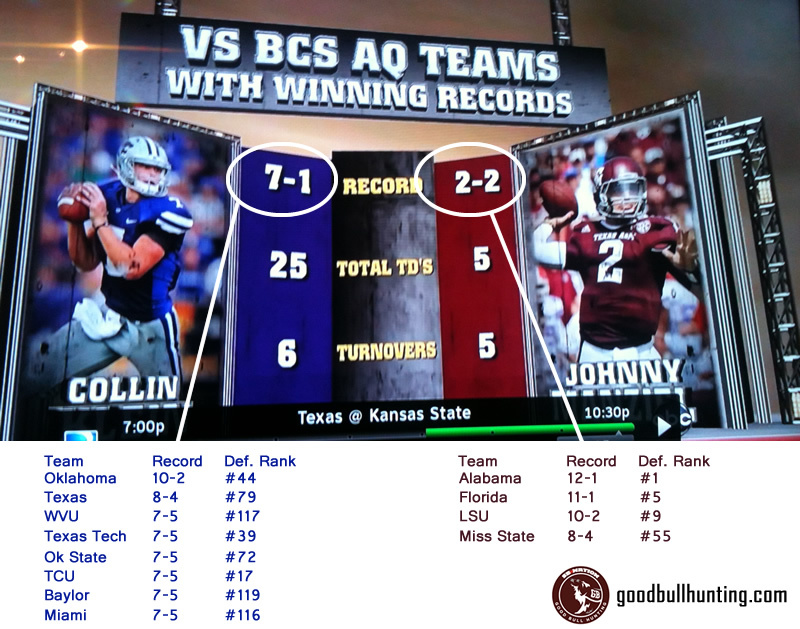 If you watched the Kansas State vs. Texas Longhorns football game on December 1, 2012, then you probably saw the graphic that ABC displayed showing what appeared to be some kind of statistical break-down of the differences between Colin Klein and Johnny Manziel. The comparison was awful as it didn’t explain the stats it was displaying. I have seen stats skewed in every way possible, but this was one of the worst. It was as if ABC was trying to make a last push effort for Klein. Aren’t media outlets like ABC suppose to be unbiased? Oh wait…ABC, ESPN, and Disney are all the same company? I should have known. At least the guys over at GoodBullHunting.com “fixed” the graphic and displayed it on their site with the numbers behind the numbers. The other graphic on their site, which I posted here not too long ago, showed that Johnny Manziel has faced 3 teams that are in the BCS Top 5. However, Colin Klien has produced numbers that are not quite as good as Manziel’s, against competition that isn’t among the best in the nation. This entry was posted in 2012, Heisman by Travis Normand. Bookmark the permalink. Lee Corso would love to “spoon” Desmond Howard , but rumor has it that Howard , has his eye on spooning Jesse Palmer .